How about something special for National Strawberry Day (February 27th): strawberry salsa. 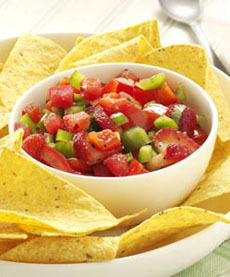 In addition to serving with tortilla chips, strawberry salsa is delicious over grilled chicken, fish or pork. This recipes was adapted from TasteOfHome.com. You can customize it by adding other fruits to the strawberries. Mango, grapes, pineapple, pomegranate arils and stone fruits are a few options. TIP: Wear disposable gloves when cutting and seeding hot chiles; then clean the cutting board and knife, wash your gloved hands and dispose of the gloves. Accidentally touching your eye with the most minute amount of capsaicin fom the chile is an experience you never want to have. Strawberry salsa made with optional bell pepper. Photo courtesy Taste Of Home. 1. COMBINE all the ingredients. Refrigerate and let the flavors meld for an hour or more. 2. SERVE with chips or as a protein garnish.